A remastered version of an arcade title Psyvariar Revision. Psyvariar Delta is a classic shoot’em up game, in which we control a futuristic fighter and eliminate everything in our way. 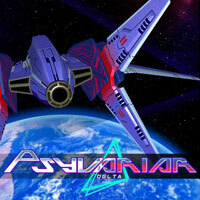 Psyvariar Delta is an enhanced version of Psyvariar Revision, an arcade title developed by Success Corporation and later released for consoles. The story of Psyvariar Delta takes place in a far future. Humanity has been forced to leave the Solar System to start a new life under the watchful eye of artificial known as GUIS AI. But the carefree journey did not last long, as a nearby supernova caused the system’s malfunction, and AI turned against its creators. We play as a pilot of a futuristic fighter and are tasked with eliminating everything that UIS AI throws at us to put an end to the human civilization. Psyvariar Delta uses a top-down perspective, as we control a vehicle that constantly goes towards the upper part of the screen by moving it from side to side. The game consists of levels filled with enemies, and our task is to eliminate all of them. Unlike most titles of the genre, we don’t collect any power-ups. Developers replaced them with a Buzz system, which increases the firing rate and power of our weapons. Additionally, dodging enemies and their attacks at the very last moment charges a special energy bar – filling it grants us a temporary invulnerability. The game lets us play both by ourselves or in a company of another player through a split-screen mode. Compared to Psyvariar Revision, the title offers more game modes: Score Attack (in which we try to get as many points as possible) and Replay Mode+ (not only used for watching saved walkthrough of a stage, but also allowing us to outperform our previous score). There is also a tutorial called Practice Mode that explains the basics of the game, as well as online rankings. Psyvariar Delta has three-dimensional visuals based on polygons, differentiating from the original release with higher resolutions. Developers also provided options for customizing the game’s interface and expanded the soundtrack, adding new tracks and introducing music from the mobile entry in the series – Psyvariar Reassemble.